John Reid has been accused by his critics of substituting tough talk and eye catching initiatives for effective as he launches a fresh crackdown on illegal immigration. John Reid: Does his choice of language fit Tony Blair's 2005 test? The Liberal Democrats' Nick Clegg has gone so far as to claim Mr Reid is encouraging the suspicion he is adopting an Alf Garnett attitude towards foreigners in a bid to divert attention away from his lack of effective action on the issue. Few would doubt that, when it comes to talking the talk, the current home secretary uses some of the most direct language available. Defending his latest attempts to make the immigration and asylum system fit for purpose he has, for example, spoken of "foreigners" coming to the country illegitimately "stealing our benefits" and services such as the NHS, and undermining the minimum wage. He spoke, on BBC radio, of "throwing out" record numbers of failed asylum seekers last year and promised those in the UK illegally would have their lives made more "uncomfortable and constrained". He insisted measures such as requiring foreigners have ID cards from next year, and putting together a "watch list" of illegal migrants to stop them claiming benefits or services, were what the public were demanding. 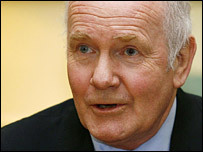 His comments have led the Joint Council for the Welfare of Immigrants to warn Mr Reid against "hyping up" public emotions on the issue. 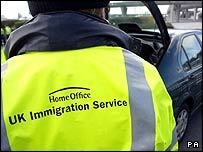 Shadow home secretary David Davis said Mr Reid had now given up trying to deport illegal immigrants. And Mr Clegg said "impersonating Alf Garnett" and yelling at foreigners would not absolve him of responsibility for migration failings. It is that last attack that goes to the heart of many of the criticisms of Mr Reid's approach to his struggling department - that he relies on his image as the hardest man in government to persuade people he is taking action. He is not the first home secretary to adopt a controversially tough attitude to this highly-sensitive issue, however. Former Tory home secretaries were regularly accused by Labour of playing the race card over immigration. In April 2002 former home secretary David Blunkett caused a storm of protest when he spoke about asylum seekers "swamping" some schools - a remark which recalled Margaret Thatcher's much-criticised phrase about Britain being "swamped by an alien culture". But, just before the last general election, Tony Blair warned against the use of "alarmist rhetoric" on the issue, claiming the Tories' language often suggested "uncertainty, even hostility, to the position of migrants and their families in Britain". The message from the prime minister back in 2005 was to keep the rhetoric responsible while taking reasonable, humane action to tackle an issue which had risen dramatically up the voters' list of concerns. And that, presumably, will be the test Mr Reid will have to pass as his new measures come on stream.